This recipe was sent to me by one of my beautiful readers, Leila. This recipe has been passed down from her Grandmother. 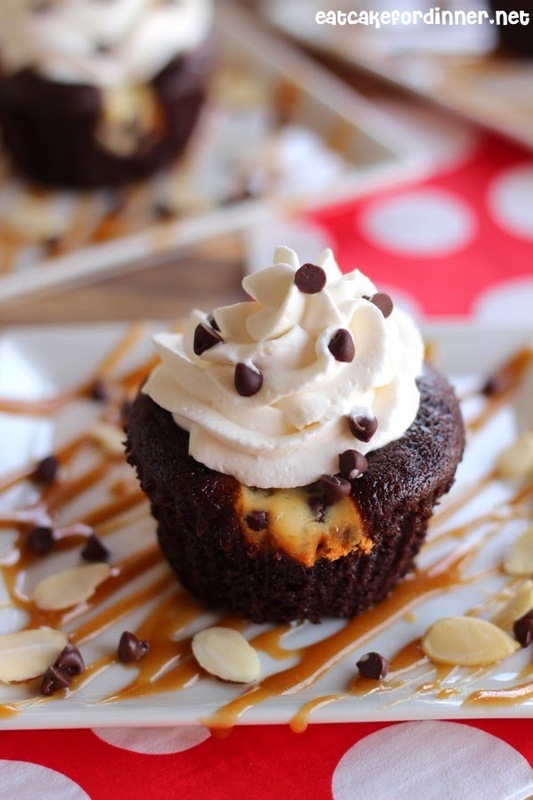 Chocolate Chip Cheesecake baked inside a chocolate cupcake? NO need to twist my arm. Her family enjoys them plain, but I like super sweet and decadent desserts, so I added some fresh Whipped Cream and Homemade Caramel Sauce. 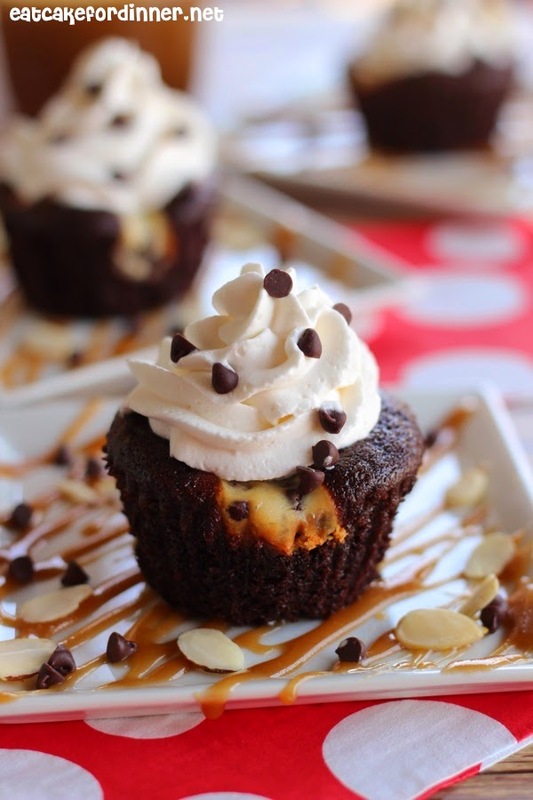 Between the chocolate cupcake and the semi-sweet chocolate in the cheesecake, these cupcakes are pretty rich and I personally think you must serve these with whipped cream. It really lightens them up and made them absolutely delicious. 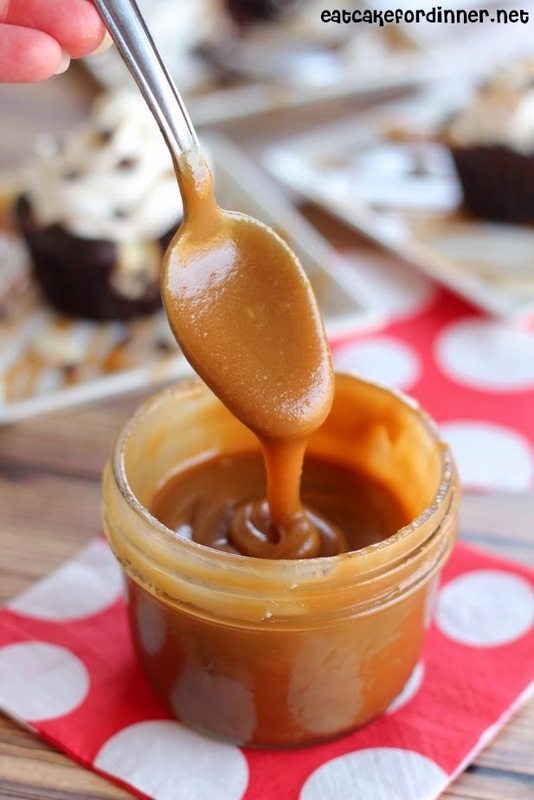 I found an extremely easy recipe for caramel sauce, but since it is made with a lot of brown sugar, it is very very rich and a small amount is plenty. But . . . the caramel sauce could be skipped and these would still be just as good. AND, I really only liked this caramel sauce the day it was made. The texture changed a little after being refrigerated overnight. How impressive do these look with that cheesecake layer baked inside? The best part is, they are really so easy to make. You could even switch up the flavor of the cheesecake filling if you wanted. Maybe a mint chocolate chip version? Thanks to Leila for sharing this delicious family recipe with me. Preheat oven to 350 degrees. Line muffin tin with paper liners and spray with cooking spray. Combine flour, sugar, cocoa, baking soda and salt. In a separate bowl combine water, oil, vinegar and vanilla. Add wet ingredients to dry ingredients and stir together until combined. Fill cups approximately 1/3 of the way full with chocolate batter; set aside. For the Cheesecake Filling: Combine cream cheese, egg, sugar and salt and mix until creamy. Stir in the chocolate chips. 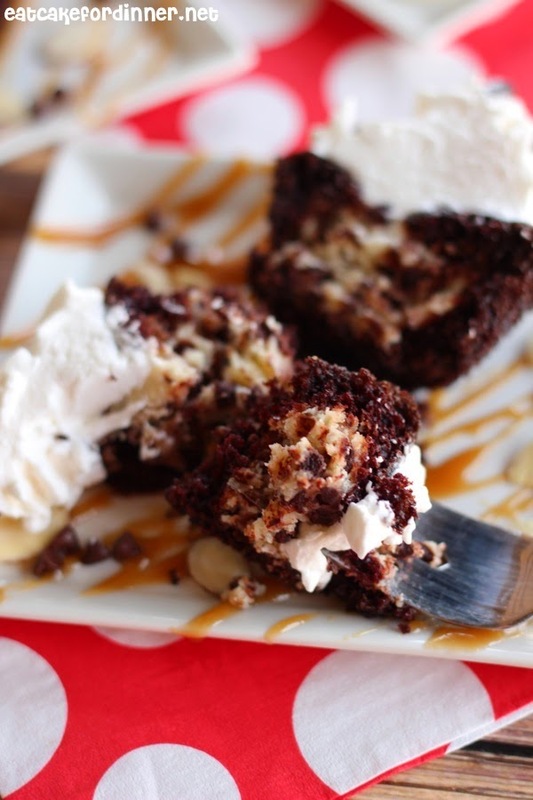 Place a heaping Tablespoon of cheesecake batter over the top of the chocolate batter in each muffin cup. Bake for 25-30 minutes or until a toothpick inserted in the center comes out clean. Cool completely in muffin tin. Store any leftover cupcakes in the refrigerator. Makes between 20-24 cupcakes. Jenn's Notes: Mine were perfect at 27 minutes and I loved them with whipped cream on top. Fantastic cupcakes! The filling sounds just great! I am drooling. These look amazing! Pinning!!! 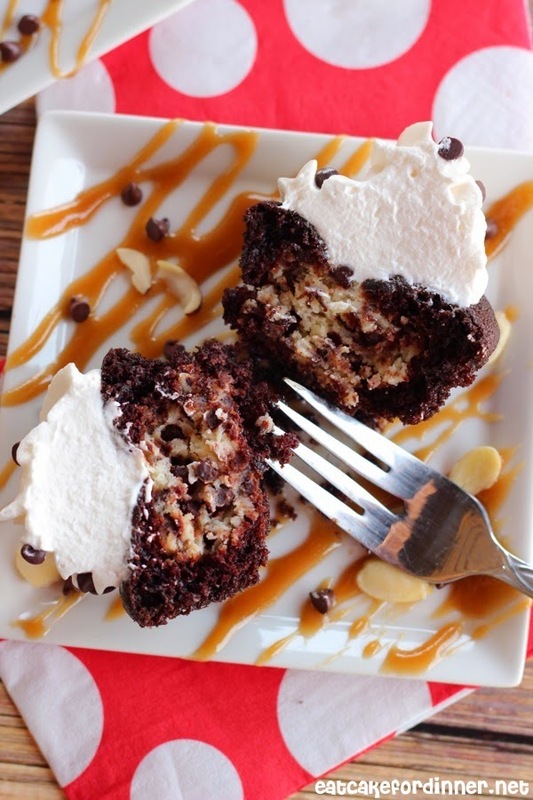 Oh my this look so sinfully good must try. These sound great! Pinned to my Cupcake Board. Oh my goodness, they look amazing! Must make those and SOON! Love these cupcakes. My grandma would always make them for me. After I moved away she would send them with people who visited me so I still got to enjoy them. So sweet! 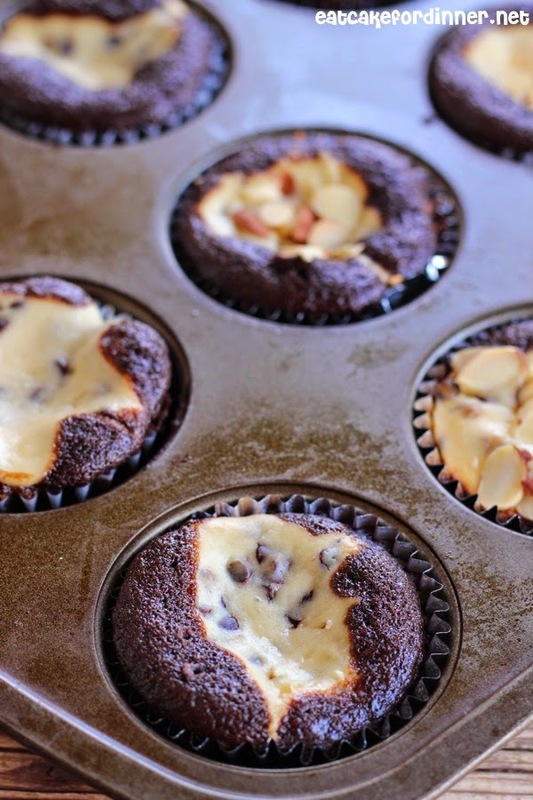 Chocolate cupcakes with a cheesecake center sounds perfect to me. And they look amazing too!